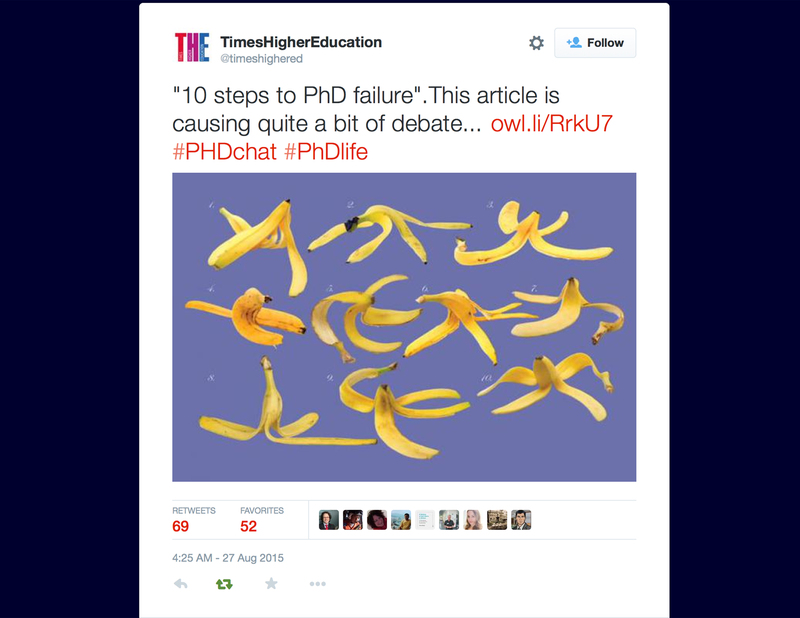 It is great to get so much positive feedback on our piece, 10 steps to PhD Failure, in the Times Higher Education Supplement yesterday. 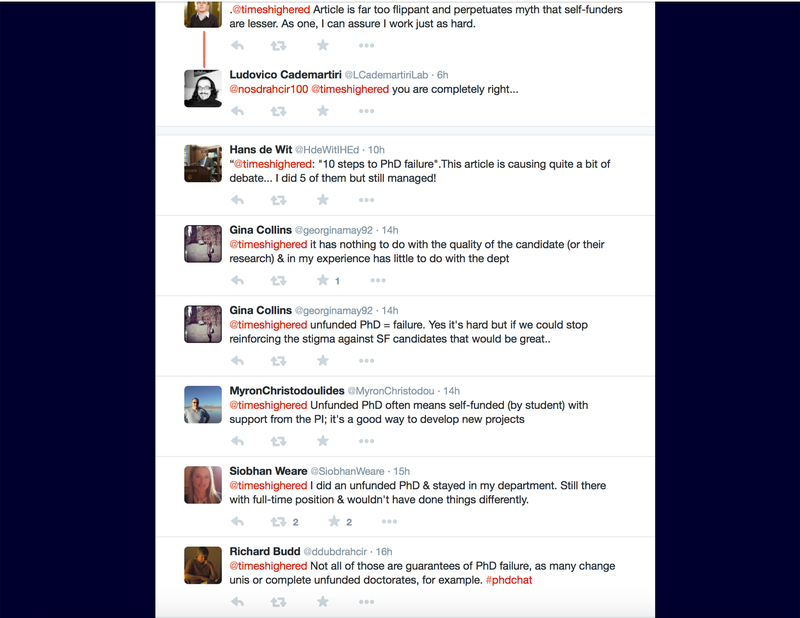 One bit of commentary that surprised us pertained to our warning about the dangers of doing an unfunded PhD. 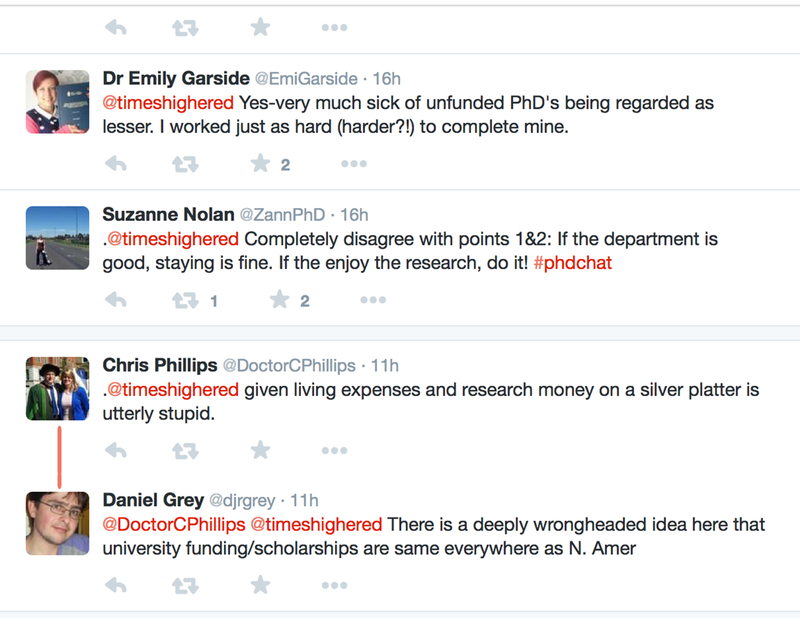 Most startling was that some people on Twitter believed we were actually disparaging people who self-fund their PhD, which is absolutely not the case. Self-funded students work hard and deserve our respect and admiration. Indeed, they often have to work much harder and overcome more serious hurdles than students with reasonable funding packages. And that, in part, is our point – an absence of funding will make your life way more difficult than if you can obtain adequate funding. Some tweeters noted that this advice generalized too broadly about different situations, which is inevitably true when writing a couple of hundred words about situations that vary by discipline and country As always, students need to seek out advice that applies more specifically to your personal situation. Instead, we would encourage interested individuals to read Natacha Chtena’s blog on her decision to do an unfunded PhD, where she notes: “Looking back, I think that more than anything I was delusional. Wearing pink glasses and riding a unicorn, I repeatedly told myself that ‘everything will be OK.’” She sets out solid reasons why many students have discovered the hard way that it is often not OK.
At a time when unprecedented numbers of graduate students are surviving off food banks, when student debt loads are at an all-time high, and large numbers of graduates are ending up in precarious and often exploitative adjunct positions, suggesting that students just need intellectual passion dangerously sidesteps the need for students to think hard about the prospects of finishing a self-funded PhD, as well as factoring in both the short and long term financial implications of doing a PhD. Students need intellectual passion, but they also need a hard-headed realistic sense of the financial costs of doing a PhD – something about which many incoming PhD students are only dimly aware. This entry was posted on August 28, 2015 by KHAD and tagged 57 Ways To Screw Up Grad School, Funded PhD, Self Funded PhD, Times Higher Education, Unfunded PhD.